100% Authentic Radley London. Style: Tote. Material: Leather. Shoulder Strap: (Not Applicable). Hardware: Gold. Condition:New with defects. 100% Authentic - Good Condition Item has slight imperfections. 100% Authentic Radley London. Style: Tote. Shoulder Strap: (Not Applicable). Material: Leather. Bag Length: 12.25. Bag Depth: 5.25. -Minor dents on exterior. Adhesive residue on interior. Radley leather handbag. Snap clasp. Pretty flower and bird pattern. Otherwise the bag is good. RADLEY . WORK HANDBAG. LOVELY BLACK. & SHOULDER STRAP MISSING. SOFT LEATHER. with dust bag. BLACK SOFT LEATHER TOTE SHOULDER BAG BY THE VERY POPULAR RADLEY. HIGHLY DESIRABLE . Grab bargain. so grab yourself a bargain. If you want a new bag with no wear then this bag is not for you. The quality pictures combined with the zoom feature allow you to inspect the finer detail and quality of the bag. THIS IS A LOVELY BLACK LEATHER BAG BY RADLEY. IT HAS BEEN USED QUITE A BIT BUT ALL LEATHER IS IN VERY GOOD CONDITION. THERE ARE TWO FURTHER ZIPPED POCKETS INSIDE AND TWO WALL POCKETS. OTHER FEATURES ARE A SMALL OPEN POCKET AT THE BACK. A GORGEOUS GRAINED LEATHER SYON PARK HANDBAG. 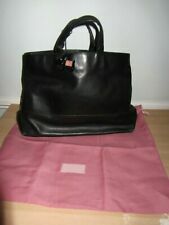 Beautiful black leather Radley tote bag. It measures 30cm across the top, from each shoulder strap, 25cm across the bottom, 10cm wide across the bottom and 22cm deep. 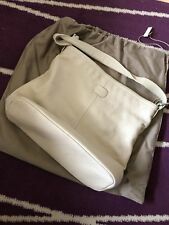 It has a compartment on the back and has a detachable/adjustable shoulder strap and inside zip compartment and two inside pockets The inside is cream. Excellent condition inside and out. GENUINE RADLEY LONDON. NAVY BLUE BACKGROUND WITH RADLEY DOGS AND POLKA DOT PRINT. Navy Blue Background with Off White Polka Dots and a Playful Print of Much Loved RADLEY Dogs in Cerise Pink. Great Foldaway Design - Allows the Bag to be Carried in its Own Matching Pouch which could then Double Up as a Purse / Pouch etc. Back slip pocket. Hidden front slip pocket. RADLEY "Berwick Street" Soft Leather Hand/Shoulder Flapover Bag in Black Brand New, With Tags * Beautiful Soft Black Leather * Flapover Top with Magnetic Closure * Double Leather Grab Handles can also be worn on the Shoulder * Two Leather Base Protectors * 1 Zipped and 2 Open Internal Pockets * "Radley London" Embossed on the Front of The Bag * Embossed Radley Dog Tag * Contrasting Grosgrain Fabric Lining * Approximate Size of Bag W30cm x H25cm x B10.0cm (Excluding Handles) * Complete with Dust Bag Brand New With Tags RRP £229.00 Great Gift All Items Are 100% Genuine and Purchased Direct from Radley. Great design in a beautiful shade of green leather. In Green Leather. Grossgrain lining. Double handles that fit comfortable on your shoulder or crook of arm (23 cm drop). Rose gold-tone exterior hardware, 1 back slip pocket & footed bottom. 1 interior zip pocket & 2 slip pockets. Leather; lining: polyester, viscose. Pale mint green perfect for spring. two rolled leather grab handles. Hanging leather Radley dog. Internal zip and two slip pockets, back slip pocket. REAR SLEEVE POCKET. FLAP TO FRONT WITH THREAD THROUGH LEATHER TAB CLOSURE THROUGH STRIPED KNOT FEATURE WITH MAGNETIC SNAP. LITTLE HANGING DOG IS MISSING. MATERIAL - LEATHER. SENT IN CLOTH BAG. CLEAN STRIPED COTTON LINING WITH 2 INNER ZIP & 2 SLEEVE POCKETS & KEY FOB STRAP. Bead feature. 2 x internal long zip pockets & 2 handy open pocket and a concealed outer mini pocket. STUNNING DARK CHOCOLATE BROWN TIBET BAG AND PURSE. 36CMS WIDE BY 23CMS HIGH, INCLUDES A PURSE. QUITE A SOLID WELL MADE BAG WITH LOTS OF THICK LEATHER, QUITE WEIGHTY NOT FLIMSY IN THE LEAST, WELL MADE. SIGNATURE RADLEY DOG CHARM. NAVY & GREY STRIPED LEATHER FLAP OVER TOP BAG. LEATHER FEET ON THE BASE. 3 INTERNAL POCKETS (ONE ZIPPED) AND A BACK SLIP POCKET. 22CM HIGH X 31 CM WIDE. 12 CM DEEP. GROSGRAIN LINING. Radley Explorer. Radley Grab Signature Bag. Wonderful applique picture of Radley towing a trolley of presents through the snow. This bag is from the Autumn/Winter 2004 Radley handbag season. The main section of the bag is fastened with a magnetic fastener on a tab-flap.